Need help figuring out what size to order? Find out in our Frequently Asked Questions section of our site. Glides Insert Leg Screw/Nail In Misc. Clear sleeve slip on furniture sliders for carpeted floors sold in 5 different round sizes ranging from 1 inch to 2 inch. These long lasting furniture glides for carpet are sold in packs of 4. New -Slip-On Furniture sliders. Protects your carpets, and allows furniture to slide easily. Replace your worn caps on your chairs. 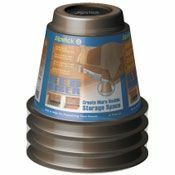 Get these floor protectors for the bottom of your chairs, tables or any wooden furniture you want to be easier to move. Two styles available: felt for hard surface floors, hard carpeted base for carpeted floors. 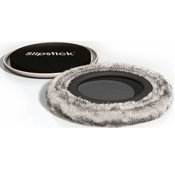 Purchase these felt and carpeted glides in brown or white. Many sizes of Floor Glides. Circular and square glides with adhesive will help you move heavy furniture, without hurting your back! Floor glides work on any surface, from carpeting to wood flooring. 2" and 3.5" triangular floor glides. Great for dressers, cabinets, chests, and dressers. Protects your floors against scratches, and allows you to move your furniture easier. Protect your floors and furniture with these great sled chair glides. 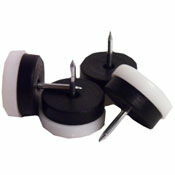 Protect your floors with Madico Nail On Glides made of polypropylene. Everything you need to protect your floors in one convenient package. Add 3 1/4" of extra storage under your bed or other furniture with these bed risers. Surface Shields Carpet Sliders make moving heavy furniture a breeze. These sliders for furniture will glide across the floor with ease. 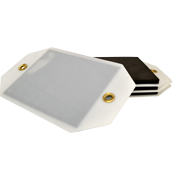 Four carpet surface sleds per pack.